I have infoset query filled from external program and query returns all 39 filed correctly for all columns data when it running on sap ERP side. 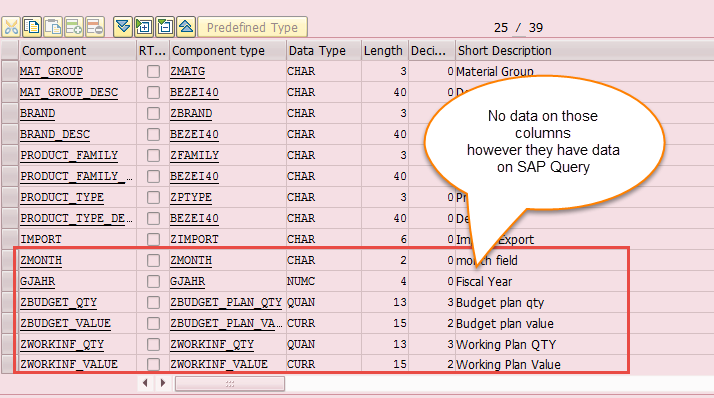 But when consuming this query from SAP Analytics cloud, there are about 6 columns doesn't have any data value ,they are empty , although they have data on sap query. Maybe you could share more fields/screen shot of the query? Were you able to figure this issue out? Are you using the same user account in SAP Gui and SAC? I presume that when you preview this data using that account, you can see values in those columns. If you have another client tool that an connect to the Infosets: Crystal or others, it would be useful to see if you get the same behaviour. Ultimately, you can find information on Tomcat logs (Cloud Agent) if there are errors. I am not an expert in ERP. I believe you should trace your user when connecting from Lumira and verify the errors displayed. It may be related to missing authorization.